Tao is the Source, the creator of Heaven and Earth, the universal principles and laws. Tao is The Way. As a Source Channel and servant, Dr. and Master Zhi Gang Sha received sacred Tao Song Mantras for the seven Soul Houses (energy chakras) and more on May 27, 2011. These sacred songs are priceless, powerful Tao treasures that carry Tao frequency and vibration to help you clear your soul heart mind body blockages in every aspect of life. 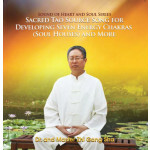 This CD combines all of these sacred Tao Song Mantras into one practice. Listen to Master Sha. Enjoy the Tao music from Tao Master Composer, Master Chun-Yen Chiang. Chant with Master Sha. Practice with Master Sha. Transform and bring flourishing to your health, relationships, finances, intelligence, and every aspect of life.